A Few Scraps: Why is it? Just in my sewing room reflecting on my varied ability to choose fabric. Does this happen to you? Thank you everyone who entered the giveaway for my book, I loved reading about the things that were bringing you joy: your children, grandchildren, partners, parents, friends, family, jobs, births, weddings, endeavors and of course quilting!! The winner is #58, Linda Fleming! Linda please contact me by the end of the week with your mailing address. A backing sometimes takes me weeks or months-- causing a quilt to turn into a UFO. Binding is quick-- I just grab whatever is closest. It takes me much longer to choose the fabric for a quilt top than any of the rest - fortunately! That way they get finished rather than sitting on a pile of UFOs!! I think because the "next" quilt is in my head as I'm working on the "now" quilt I use my overgrown stash as my pallet. I love color and I love scraps. I'm compulsive that way! I don't have trouble picking backing, but I usually piece my backings. Picking binding is another story. It needs to look good with the front AND the back. It needs to enhance the quilt not distract from it. I do get stuck there at times. I can pick for the top, back and binding quickly......but then change my mind at least twenty times! 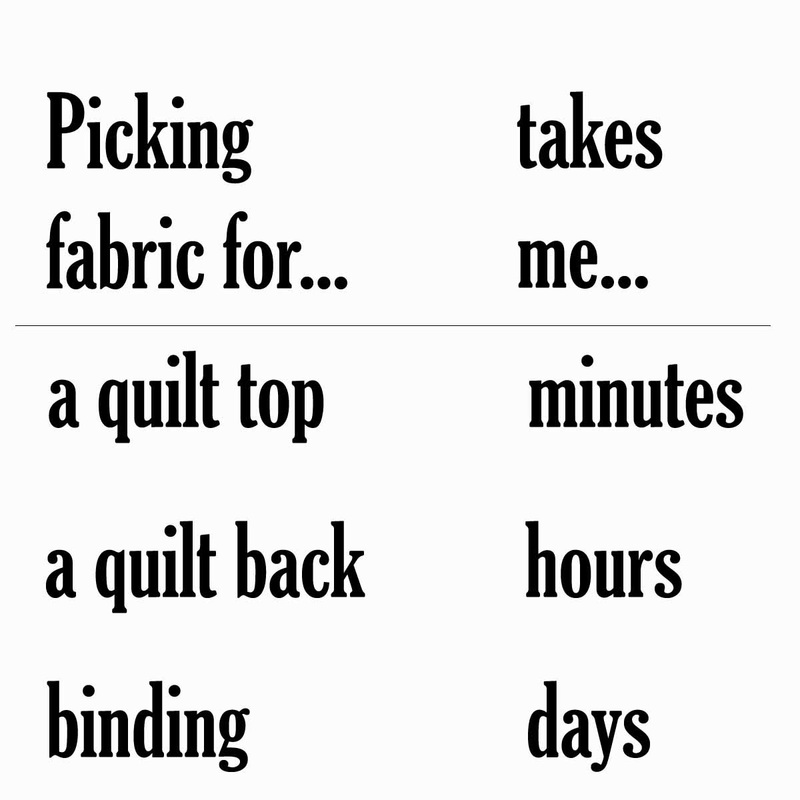 for me it's the quilting design that takes me forever! I went on a retreat this weekend and (for the life of me) couldn't decide on fabric for the Pickle Dish quilt I'm making. Ended up putting it back in the bin for future sewing and made something I didn't even know I wanted to make and it took no time to figure it out! I totally know what you talking about! If it's for a gift I can make the selections fast. If it's for my own use, I can spend weeks thinking about it. I just ordered your book, can't wait for it to arrive. I enjoyed reading some of your blog. Thanks for sharing. It doesn't take me long to pick fabric for any quilts. I'm alot like Quiltin'invt, however I don't just have the next quilt in my head...but I have the next 5 quilts in my head! I too love scraps and bold colors. I'm really afraid of FMQ but I'm adding your book to my Amazon wishlist. First Steps to Free-Motion Quilting: Giveaway!